Located in the heart of a serene seaside town in Goa is Devarya Wellness, where you can breathe, experience and live the yoga life. Spanning 7,000 square metres, this green retreat overlooking the Morjim Beach is a peaceful sanctuary for those seeking an escape from the monotony of a busy, urban existence. At Devarya, which translates into Divine Belief in Sanskrit, everyone from beginners to seekers and yogis can experience the goodness and mindfulness of a holistic yoga lifestyle. 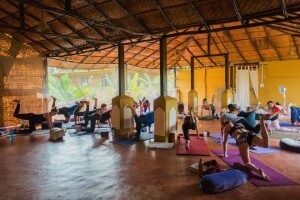 Our skilled teachers with years of experience in Hatha yoga, Vinyasa yoga and Iyengar yoga, have helped create an environment where you can enjoy a relaxing yoga holiday, undergo an intensive advanced training program or immerse yourself in a yoga retreat with like-minded souls from all over the world.